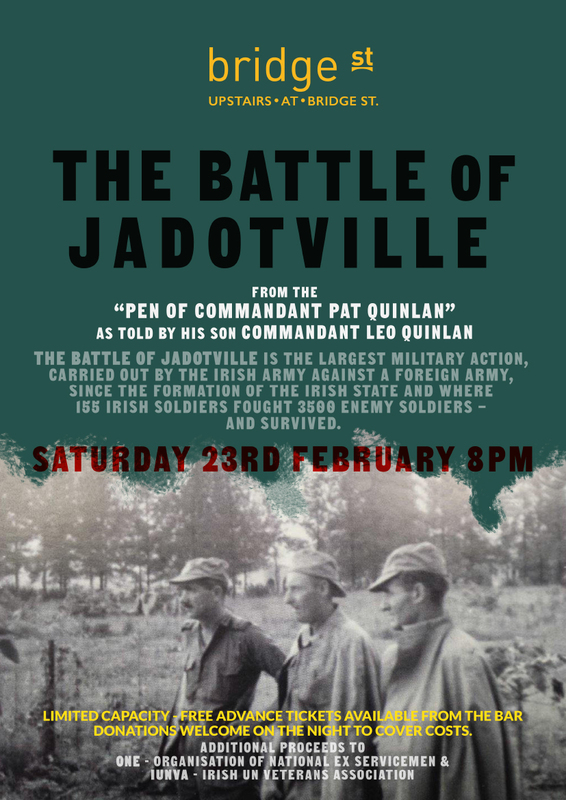 The Battle of Jadotville presentation is from the "Pen of Commandant Pat Quinlan" (Officer Commanding the Irish Troops at Jadotville in the Congo in 1961), as "Told by his son Commandant Leo Quinlan". The Battle of Jadotville is the largest military action, carried out by the Irish Army against a foreign army, since the formation of the Irish State and where 155 Irish soldiers fought 3500 enemy soldiers - and survived. The Power Point Presentation (with original photographs from the event) covers the six months tour of duty by the Irish Company and covers all major activities of the Company with particular focus on the Battle of Jadotville and subsequent period as POW's. During the presentation the reasons for the survival of the Irish Company are identifiedas exceptional Leadership (at all levels), Training, High Level of Military Skills, Respect (two way), Trust, Discipline, Empowerment, High Morale, Teamwork and Comradeship. (The high level of military and personal skills was extraordinary when one considers the average age of the Irish soldiers was 18.5 years with two soldiers only 15 years old). Included also in the presentation is the story of the families at home in Ireland and their fears, stresses, reactions, happiness etc as the events in Jadotville unfolded. The aftermath of Jadotville and its effect on veterans and families ends the presentation. Leo Quinlan was 16 years old at the time of the Battle of Jadotville. He joined the Army one year later, was commissioned a Lieutenant and served for 25 years in Ireland, overseas with the United Nations and in the Army Rangers. During his army service he served with many Jadotville veterans. After leaving the Army he has been working freelance for the European Commission in 46 countries. He is also a professional landscape artist with his own Art Gallery.